This week, I was lucky enough to be invited to the inaugural sailing and naming of Celebrity's newest ship, The Edge. There has been so much hype about this ship because it is so different than your traditional cruise ship. To say it has been amazing is an understatement- I'll share more about my trip later! The warm weather has been very welcome and although it takes me out of the Christmas-feeling a bit, I'm ok with that for a few days! Wearing: I finally got this Straw Bag I have been wanting for a while now. It's pricey- especially just for a straw bag, but it's just so gorgeous and it fits so much. I can fit my big DSLR camera and everything else in nicely! It will be a great beach/pool tote, too! Drinking: The bartender at the Polo Bar this past weekend served us tequila shots and he served them with cinnamon over an orange wedge and it was SO good. It truly made such a difference and really brought out the sweetness in a tequila. I loved it and will now be doing this instead of lime and salt. Gamechanger. Reading: Loved this Southern Living article that talks about the nostalgic Christmas trees! Did you grow up with one in your home? My mom puts hers out every single year and I love it. She made hers in a ceramics class that she took with my aunts when she was in her 20's which makes it even more special! It's kitschy and not really something I would typically like, but having grown up with it, it's something I just love! Target is selling one somewhat similarly, but I would love to find somewhere where I could create my own like my mom did! Sale-ing: One of my favorite cashmere cardigans is on sale! I've had a few for years and always get so much wear out of them. They're just a great, luxe basic! Watching: Did you guys hear the Friends rumor that it would be leaving Netflix on January 1st? Thankfully, it was just a rumor so let's keep our fingers crossed it continues to stay on Netflix! It is one of my favorite go-to shows! Loving: This sweater is just gorgeous. Would look great casually with boyfriend jeans or dark wash skinnies but you could also dress it up with leather leggings and heels. I am usually a neutral gal, but dare I say, the yellow is quite beautiful! Wanting: There hasn't been too much on my radar this week since I have been away from the computer a lot but here are a few great items! 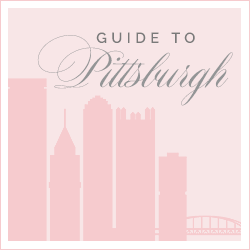 Pittsburgh-ing: Did you know that there are five Christmas pop-up bars in Pittsburgh? I think Jingle bar might be my favorite! Traveling: I'm currently in Florida soaking up the sun! Follow along on instagram for more! Quoting: 'What makes you happy doesn't need approval from anyone else.' // See more of my favorites, here. For the nostalgic trees, we have one my grandmother made that always is put on the table in the hall between all the bedrooms at my parents' home. I love history it brings into the family decor even if it is not in the main space.